I now have two clients who tried blogging, with the best of intentions, but didn’t keep it up. One tried Twitter but that fizzled too. Now, both have set up Facebook Pages, and have finally found their social medium. Screenshot of Whitman Wharf House B&B’s homepage with Facebook feed and fans on the right. A Facebook status update is quicker than a blog, and you don’t have a 140-character limit as in Twitter. It’s easy to add photos and videos to Facebook. Facebook has broken the technology barrier for a huge percentage of the population. You probably already know how to do Facebook. If you don’t know Facebook yet, you’ll find that it’s as intuitive as any online medium can be, and the psychological rewards for learning it are immediate. Other people know Facebook too, and they’re more likely to interact with you on your Facebook Page than on a blog. You may already have a bunch of friends on Facebook who know what you do and will “Like” your page (the new equivalent of becoming a fan). Add a link to a webpage in your Facebook status update, and it instantly gives you the opportunity to choose a picture from that page. This is cool and fun. You can check in on your Facebook business page while you’re interacting with your friends, and feel virtuous (if not virtual)! People who are not Facebook members can still see your Facebook page – it is public – although they can’t leave comments. And now there’s another reason to have a Facebook Page for your business. You can easily put a “Like Box” with either a news feed of your Facebook page updates, a set of random mini profile pictures of your “fans”, or both, on your own website. I’ve just set up a Like Box for Whitman Wharf House Bed and Breakfast in Canso, NS [no longer online]. I’m very pleased with how it looks over a semi-transparent background. 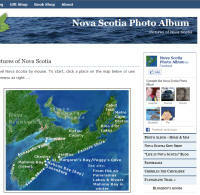 I’ve also added one to the homepage of Fireworks FX Inc.
Screenshot showing Like Box on the Nova Scotia Photo Album site, with “fans”. Inspired, I just set up a Facebook page for my own Nova Scotia Photo Album, and added a Like Box to the site. Perhaps I’ll add a WordPress plugin that copies my blog posts to my Facebook page. Then everyone who “likes” my page will see my updates in their Facebook News Feed. These updates are easily shared. The viral power of Facebook is not to be underestimated. Click here for the instructions and wizard for adding a Facebook Like Box to your website. You can customize a few parameters: width, whether to show the feed, and how many fans to show, if any. Background colour is transparent by default, and can easily be set by css on your page or an external stylesheet. Changing text colour is more complicated, however. There are other cool tools that Facebook has made available and I’ll write about them as I gain experience with them. There are disadvantages, however, to essentially having Facebook host your blog, rather than having a full-fledged WordPress blog on your website under your domain. You will probably be sending some people away from your site into a yummy, addictive, warm and fuzzy place where they are likely to get lost for the next hour, and forget to come back to your website. You are missing out on the built-in search-engine-magnetic powers of WordPress. You are not adding content and value to your own site. Non-Facebook members cannot comment on your postings. So it’s a tradeoff, and it’s up to each person to decide what works for them. However, if it’s a difference between getting it done on Facebook and not getting it done on a blog, go for the path of least resistance. What you can do with Facebook to make it add value to your site is offer Facebook-only promotions. This way, users have a reason to visit your Facebook website aside from playing with Facebook. It will also give them a reason to keep updated with your Facebook page. It could also give the people that aren’t on Facebook an extra push to spend the whole minute that it takes to sign up. Blogs are still useful, but only if someone is ready to do some reading. Often, people are looking to get a quick update from a few websites while on a break, so Facebook can be a key player in that area. Good points, Kingsley. You can also use your Facebook page to call attention to a blog post, for those who ARE willing to do some reading.